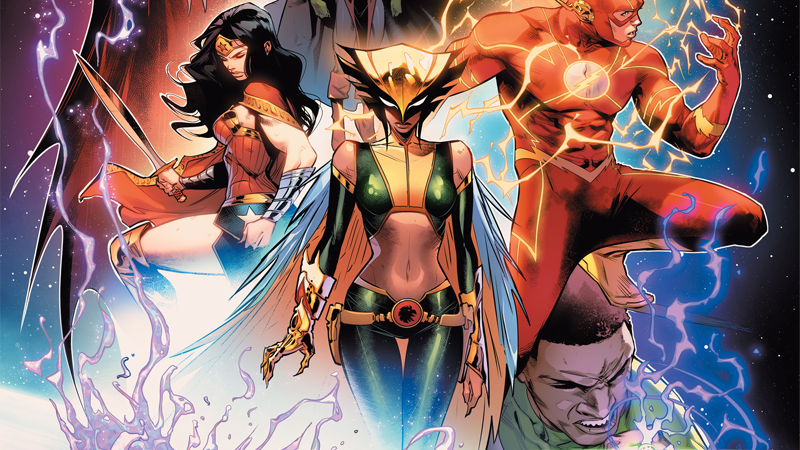 Wonder Woman, Hawkgirl, The Flash, and Green Lantern as they all appear on Jiménez’s cover for Justice League #2. This June, Justice League is relaunching, which means there’s another roster change in store for DC Comics’ foremost superhero team. The good news: If you loved the Justice League animated series, then the setup is rather familiar. Announced this morning by DC, the main Justice League series will relaunch in June as a bi-weekly title. Scott Snyder—the former Batman scribe and current writer of the totally wild event series Dark Nights: Metal—will be joined by artists Jorge Jiménez and Jim Cheung (who is predominantly known for his work at Marvel Comics). Cheung will handle art duties for Justice League #1, while Jiménez boards the title for issue two, but DC has yet to confirm how the artists will handle the series beyond that. Jim Cheung’s full cover for Justice League #1. Yup, save for a swap in of Barry over Wally West, and the addition of Cyborg, this is pretty much the team we all knew and loved in the fabulous Justice League animated series. Hawkgirl is a natural addition to the team, given Kendra’s major re-involvement with the DC universe in the events of Dark Nights: Metal (alongside a new and just-as-convoluted tweak to her origin story to add to the long, long list of convoluted tweaks to her origin story), but John Stewart is a nice surprise. Jorge Jiménez’s full cover for Justice League #2. Since the New 52 reboot, John has mostly been confined to the cosmic realms of DC’s comics, while Hal Jordan (and then, more recently Simon Baz and Jessica Cruz, the most recent GLs of Earth) served as the Corps’ representative in the League. Recently in DC Rebirth, John had an even bigger role in the stars leading the Green Lantern Corps, but it looks like he’s now being brought back home for a stint. We’ll find out why when Justice League #1 hit shelves June 6.